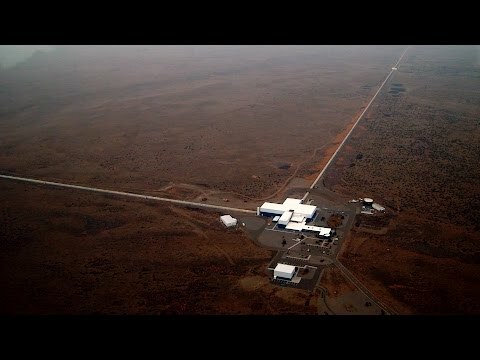 Built to look for gravitational waves, the ripples in the fabric of space itself that were predicted by Einstein in 1916, the Laser Interferometer Gravitational-Wave Observatory (LIGO) announced the detection of gravitational waves—generated during the final fraction of a second of the merger of two black holes to produce a single, more massive spinning black hole—on February 11, 2016. Barry Barish, Caltech's Ronald and Maxine Linde Professor of Physics, Emeritus, was LIGO's principal investigator from 1994 to 1997, and director from 1997 to 2006. Stan Whitcomb (BS '73) was an assistant professor of physics at Caltech from 1980 to 1985. He returned to campus as a member of the professional staff in 1991 and has served the LIGO project in various capacities ever since. We talked with each of them about how LIGO came to be. How did LIGO get started? BARISH: Einstein didn't think that gravitational waves could ever be detected, because gravity is such a weak force. But in the 1960s, Joseph Weber at the University of Maryland turned a metric ton of aluminum into a bar 153 centimeters long. The bar naturally rang at a frequency of about 1,000 hertz. A collapsing supernova should produce gravitational waves in that frequency range, so if such a wave passed through the bar, the bar's resonance might amplify it enough to be measurable. It was a neat idea, and basically initiated the field experimentally. But you can only make a bar so big, and the signal you see depends on the size of the detector. [Professor of Physics, Emeritus] Ron Drever, whom we recruited from the University of Glasgow, had started out working on bar detectors. But when we hired him, he and Rainer [Rai] Weiss at MIT were independently developing interferometer-type detectors—a concept previously suggested by others. Usually you fasten an interferometer's mirrors down tightly, so that they keep their alignment, but LIGO's mirrors have to be free to swing so that the gravitational waves can move them. It's very difficult to do incredibly precise measurements with big, heavy masses that want to move around. WHITCOMB: Although bar detectors were by far the most sensitive technology at the time, it appeared that they would have a much harder path reaching the sensitivity they would ultimately need. Kip Thorne [BS '62, Richard P. Feynman Professor of Theoretical Physics, Emeritus] was really instrumental in getting Caltech to jump into interferometer technology and to try to bring that along. Ron's group at Glasgow had built a 10-meter interferometer, which was all the space they had. We built a 40-meter version largely based on their designs, but trying to improve them where possible. In those days we were working with argon-ion lasers, which were the best available, but very cantankerous. Their cooling water introduced a lot of vibrational noise into the system, making it difficult to reach the sensitivity we needed. We were also developing the control systems, which in those days had to be done with analog electronics. And we had some of the first "supermirrors," which were actually military technology that we were able to get released for scientific use. The longer the interferometer's arms, the more sensitive it can be for gravitational waves. We bounce the light back and forth hundreds of times, essentially making the interferometer several thousand kilometers long. When did the formal collaboration with MIT begin? BARISH: Rai [Weiss] and Ron [Drever] were running their own projects at MIT and Caltech, respectively, until [R. Stanton Avery Distinguished Service Professor and Professor of Physics, Emeritus] Robbie Vogt, Caltech's provost, brought them together. They had very different ways of approaching the world, but Robbie somehow pulled what was needed out of both of them. Robbie spearheaded the proposal that was submitted to the National Science Foundation in 1989. That two-volume, nearly 300-page document contained the underpinnings—the key ideas, technologies, and concepts that we use in LIGO today. A lot of details are different, a lot of features have been invented, but basically even the dimensions are much the same. WHITCOMB: When I returned in 1991, LIGO had become a joint Caltech-MIT project with a single director, Robbie Vogt. Robbie had brought in a set of engineers, many borrowed or recruited from JPL, to do the designs. The late Boude Moore [BS '48, MS '49], our vacuum engineer, was figuring out how to make LIGO's high-vacuum systems out of low-hydrogen-outgassing stainless steel. This had never been done before. Hydrogen atoms absorbed in the metal slowly leak out over the life of the system, but our measurements are so precise that stray atoms passing through the laser beams would ruin the data. Boude was doing some relatively large-scale tests, mostly in the synchrotron building, but we also built a test cylinder 80 meters long near Caltech's football field, behind the gym. So all of these tests were going on piecemeal at different places, and at the 40-meter interferometer we brought it all together. We were still mostly using analog electronics, but we had a new vacuum system, we redid all the suspension systems, we added several new features to the detector, and we had attained the sensitivity we were going to need for the full-sized, four-kilometer LIGO detectors. And at the same time, in 1991, we got word that the full-scale project had been approved. How were the sites in Hanford, Washington, and Livingston, Louisiana, selected? WHITCOMB: I cochaired the site-evaluation committee with LIGO's chief engineer, [Member of the Professional Staff] Bill Althouse. We visited most of the potential sites, evaluated them, and recommended a set of best site pairs to NSF. We had several sets of criteria. The engineering criteria included how level the site was, how stable it was against things like frost heaves, how much road would need to be built, and the overall cost of construction. We had criteria about proximity to people, and to noise sources like airports and railroads. We also had scientific criteria. For example, we wanted the two sites to be as far apart in the U.S. as you could reasonably get. We also wanted LIGO to work well with either of the two proposed European detectors—GEO600 [in Hanover, Germany] and Virgo [in Tuscany, Italy]. We needed to be able to triangulate a source's position on the sky, so we did not want LIGO's sites to form a line with either of them. What makes Advanced LIGO more sensitive? BARISH: Well, it's complicated. Most very sensitive physics experiments are limited by some source of background, so the task of the experimentalist is to concentrate on the limiting background and figure out how to beat it down. But LIGO has three different limiting backgrounds. We are looking for gravitational waves over a very wide range of frequencies from 10 hertz to 10 kilohertz. Our planet is incredibly noisy seismically at low frequencies, and consequently from 10 hertz to about 100 hertz we have to isolate ourselves from that shaking. As we move up to frequencies in the middle range, we are limited by what we call "thermal noise"—the atoms in the mirrors moving around, and, at the very high frequencies, we have to sample the signal faster and faster, and we become limited by the laser's power or the number of photons we can sample in a short amount of time. This is called "shot noise." Advanced LIGO has significantly reduce our backgrounds from all three sources using a very much more powerful laser to take care of the high frequencies, a much fancier isolation system including active feedback systems for low frequencies, and larger test masses with better mirror coatings to minimize the thermal background. Such improvements were conceived from the beginning, and consequently our strategy was to build Initial LIGO with proven techniques that had mostly been tested here on campus in the 40-meter prototype; followed by Advanced LIGO, using techniques yet to be developed and tested in our laboratories after Initial LIGO was operational. Now, we are developing and testing the next round of upgrades in our laboratory. What is your reaction to the first detection? BARISH: It is fantastic! I've always had the fond wish that we would succeed by 2016, which is the hundredth anniversary of Einstein's prediction of gravitational waves. It will take three to five more years for Advanced LIGO to reach the designed sensitivity, but we are taking science data along the way, while we improve the sensitivity. The first step improved the sensitivity by about a factor of three better than initial LIGO, and that turned out to be enough to make the first detection. The sensitivity tells you how far out you can see, and volume increases with the cube of the distance. A factor of three is a very big step, and that enabled our first detection. This first detection is every bit as exciting as we could have hoped for, or maybe even more. We have directly detected gravitational waves one hundred years after Einstein's prediction, and if that isn't enough, the detection itself is proving important astrophysically—it is the first detection of such a binary black hole system—and further, the event is enabling important fundamental physics through important tests of general relativity. This is just the start, not the end. We now can confidently look forward to a very bright future as we open up this new field, using gravitational waves as both a totally new probe to observe our universe, as well as a new means of studying the fundamental physics of general relativity. No, its not the Trans-Alaska Pipeline, but two-and-a-half miles of stainless steel tubing, protected by concrete arches, reaching across a desert in the Pacific Northwest. Inside, a laser beam, bouncing between mirrors on either end (and in the adjoining arm) will try to pick up an almost imperceptible signal, when the Laser Interferometer Gravitational-Wave Observatory turns on in the year 2002.